This is a demo wiki that demonstrates what content you have created and published on this website may look like. Please note that this is a simple "project wiki" type, while there are many other availble wiki types. The "project" type is great for publishing subject-oriented material like this example about the roman empire. The content on this demo wiki has been taken from Wikipedia (http://en.wikipedia.org/wiki/Roman_Empire and some other pages, licensed under Creative Commons Attribution-Share Alike 3.0 CC BY-SA 3.0). 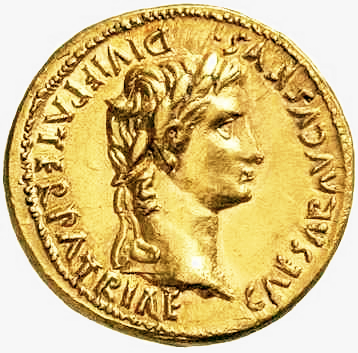 Aureus of Augustus, the first Roman Emperor. The Roman Empire (Latin: Imperium Romanum) was the post-Republican period of the ancient Roman civilization, characterized by an autocratic form of government and large territorial holdings around the Mediterranean Sea in Europe, Africa, and Asia. The 500-year-old Roman Republic, which preceded it, had been destabilized through a series of civil wars. Several events marked the transition from Republic to Empire, including Julius Caesar's appointment as perpetual dictator (44 BC); the Battle of Actium (31 BC); and the granting of the honorific Augustus to Octavian by the Roman Senate (27 BC). The first two centuries of the Empire were a period of unprecedented stability and prosperity known as the Pax Romana ("Roman Peace"). It reached its greatest expanse during the reign of Trajan (98–117 AD). In the 3rd century, the Empire underwent a crisis that threatened its existence, but was reunified and stabilized under the emperors Aurelian and Diocletian. Christians rose to power in the 4th century, during which time a system of dual rule was developed in the Latin West and Greek East. After the collapse of central government in the West in the 5th century, the eastern half of the Roman Empire continued as what would later be known as the Byzantine Empire. Because of the Empire's vast extent and long endurance, the institutions and culture of Rome had a profound and lasting influence on the development of language, religion, architecture, philosophy, law, and forms of government in the territory it governed, particularly Europe, and by means of European expansionism throughout the modern world. You may embed any available e-learning app on any wiki page (see the Roman Numerals app below). All app features are supported, including online trainers and printing worksheets (if supported by the selected app). The app support is not limited to standard apps, which means that you may also embed apps you created yourself or apps by other users for example. Check out the developer page if you'd like to know more about developing apps for this platform.